Acetazolamide is the generic version of the discontinued branded treatment Diamox. It is commonly prescribed ‘off-label’ to prevent or reduce the symptoms of altitude sickness, and sold in packets of 250mg tablets. If you suffer from altitude sickness or mountain sickness, or you’re planning to spend time at altitude (above 2,500-3000 metres), get a free consultation today. Acetazolamide can keep you from suffering symptoms, such as headaches, nausea, and dizziness. If Acetazolamide is right for you, we’ll give you a prescription that you can use to place an order for same day dispatch (before 4pm) anywhere in the UK. Acetazolamide 250mg tablets (also known as Diamox) are available to buy from The Independent Pharmacy Online Doctor service, following a free consultation, to help to prevent and treat altitude sickness. To find out more about acne and see all the available treatments, see our Altitude Sickness page. Acetazolamide has several applications (such as glaucoma, fluid buildup, epilepsy) but is widely prescribed 'off-label' to prevent or reduce the symptoms of altitude sickness. Acetazolamide can actively reduce nausea, dizziness, headache and shortness of breath associated with rapid ascents (usually anything above 10,000 feet or 3,048 metres). The prescription is ‘off-label’ because Acetazolamide was initially licensed to treat conditions other than altitude sickness, so its original instructions will not match your condition. 'Off label' means that the medicine is being used to treat a condition other than those that it was initially licensed to treat. This means that there is less established data regarding the effectiveness of this treatment for the condition which it is prescribed and means that the instructions contained in the product information leaflet will not match the condition you are treating. Click here to read studies on the effectiveness of Acetazolamide in treating Altitude Sickness 'off label'. You should always follow the instructions on the dispensing label on your medicine and contact us if you have any questions. Acetazolamide 250mg tablets works to treat altitude sickness by increasing the amount of urine produced, consequently altering the acidity of the blood. This leads to a reduction in fluid in the lungs and around the brain. The result is improved breathing and relief from the symptoms of altitude sickness. How long does Acetazolamide take to work? How long it takes for Acetazolamide to take effect depends on the person, but it’s recommended that you start taking it a day or two before you expect to need it, and continue using it during the ascent and for two or three days after you’ve reached the peak of your trip. Without medication, the symptoms of altitude sickness will usually subside in around 24-48 hours if the proper procedures are followed. Taking Acetazolamide 250mg tablets has been shown to cut recovery time in half (between 12-24 hours). Taking Acetazolamide will help to decrease the likelihood of experiencing altitude sickness in people who are forced to ascend without the proper acclimatisation. However, Acetazolamide should not be seen as a substitute for acclimatisation. Rapid ascents are dangerous with or without Acetazolamide usage. Sleeping at altitude alters a person’s breathing patterns. It is usually characterised as short, rapid breaths followed by prolonged pauses. This is quite normal and is not considered dangerous. However, it can lead to a poor quality of sleep. Taking Acetazolamide tablets will help improve this pattern of breathing, resulting in a better quality of sleep. Symptoms are unlikely to develop at heights below 2,500 metres (8,000 feet), so most trekkers, climbers or hikers shouldn’t need to take Acetazolamide. That said, anyone can suffer from altitude sickness - even if they are very fit, and it can occur at lesser heights in very rare cases. Acclimatise by ascending slowly with overnight stops at regular intervals. If you are planning to climb over 3,000 metres (10,000 feet), spend a night at an intermediate elevation below 3,000 metres before starting your final ascent. When over 3,000 metres, limit your rate of ascension to 300-500 metres (1,000-1,500 feet) per day, stopping to sleep each night. After every 1,000 metres (3,000 feet) of ascent, rest for a couple of nights before climbing any higher. If you climb more than 500 metres (1,500 feet) during one day, descend 500 metres before sleeping. A headache that won’t be relieved by taking Paracetamol and drinking water. Dizziness and a feeling of being light-headed. These symptoms usually resolve within a period between 24 and 48 hours. Descending can help you feel better more quickly. Be sure to stay hydrated and avoid alcohol and sedatives. Once the symptoms have passed, you can resume your ascent. A noisy, rattling sound while breathing. Blue or grey lips and fingernails. Loss of coordination (inability to walk in a straight line). Both conditions can appear without warning, at any time, and in those who have previously handled higher elevations without issue. They can affect people in peak physical condition, and hit visitors and indigenous people alike. Taking Acetazolamide does not fully protect you. If you develop HACE or HAPE, you must descend immediately, even during the night, and by at least 500-1,000 metres (1,500-3,000 feet). Any delay can be fatal. These conditions can be addressed with oxygen and steroid treatments, but there are no guarantees, and descending right away is critical. Acetazolamide has been found safe for use while breastfeeding, and may be deemed viable for a pregnant woman following a consultation. Pregnant women, though, should not be climbing at altitude or doing anything physically dangerous, so be extremely cautious. Stay as hydrated as you can. Consume a high calorie diet. Acetazolamide used to be known as Diamox tablets. However, the brand Diamox has been discontinued. The medication has since been re-branded as generic Acetazolamide 250mg tablets, which was the same active ingredient found in Diamox. Acetazolamide belongs to a category of medicines called diuretics. A diuretic is any substance that increases the production of urine, thus promoting the excretion of water from the body. Acetazolamide is manufactured by MercuryPharma. The tablet itself is white, round and convex with “FW 147” marked on one side. The other side of the tablet is scored into quarters. Acetazolamide is a prescription only medicine (POM). Your required dose of Acetazolamide will depend on the severity of your symptoms. You or a member of your group will need to decide on the most appropriate treatment. If you have a doctor or other healthcare professional on your trip, you should seek their advice. To treat mild early acute mountain sickness (headache, fatigue, lightheadedness, difficulty sleeping), take one 250mg tablet of Acetazolamide 250mg twice daily until symptoms resolve. You can then resume climbing. To prepare for rapid ascent without proper acclimatisation, take one 250mg tablet of Acetazolamide twice daily, beginning the day before ascent or as soon as possible after beginning, and keep taking the tablets for a few days after reaching final altitude. o treat disturbed breathing patterns, take half of one 250mg tablet of Acetazolamide twice daily until reaching an altitude comfortable for sleeping. Remember: even if you take Acetazolamide, it is still important to properly acclimatise. You should never ascend further until your symptoms have completely gone and you are properly acclimatized to your current altitude. Do not use Acetazolamide to push through the symptoms of altitude sickness and continue to climb, this is extremely dangerous and can be fatal. You’re most likely to develop side effects while your body is getting used to the medicine. Signs of infection (e.g., fever, persistent sore throat). Mental/mood changes (e.g. confusion, difficulty concentrating). Itching/swelling (especially of the face/tongue/throat). If you experience any adverse effects from taking Acetazolamide, inform your trip doctor immediately. In a medical emergency, contact emergency services or go straight to a hospital or medical centre. Each tablet contains the active ingredient acetazolamide 250mg. Sodium starch glycolate type A potato. Are allergic or sensitive to or have had a bad reaction to sulphonamides in the past. Have chronic obstructive pulmonary disease. Need to know more about Altitude Sickness? Acetazolamide is a prescription medicine known as a diuretic, which means it increases the production of urine, thus promoting the excretion of water from the body. Through inhibiting an enzyme in the body called ‘carbonic anhydrase’, it slows down certain chemical reactions in the body, changing the acidity of the blood. The net result of this is an improvement in breathing and a reduction in fluid around the brain and in the lungs. It is very important to drink a lot of fluid whilst taking Acetazolamide; at least two to three litres of water per day. Can I keep climbing if I take Acetazolamide? Taking Acetazolamide for initial symptoms should not be viewed as a green light to keep climbing. Ascent should cease until the symptoms have completely resolved, which in most cases will be within 48 hours. Acetazolamide will not protect you against your symptoms worsening if you continue to ascend; plenty of climbers who have done this have gone on to develop either HAPE or HACE. Will Acetazolamide protect me from altitude sickness if I take the tablets during rapid ascent? Acetazolamide will help reduce the risk of altitude sickness on rapid ascents, but it is not a substitute for following proper protocols and correct precautions. Rapid ascents carry serious risks and Acetazolamide does not remove them. In fact, it can make climbers feel safe enough to push through their illness, leading to much more severe conditions. When altitude sickness strikes, it may be sudden, severe and possibly fatal. I’m really fit and strong, so is altitude sickness still a threat? Treat altitude with respect and do not imagine that you can simply battle through because you are strong and fit. People who climb and hike in high places have a reputation for pushing themselves. When it comes to altitude, preparation, planning ahead, taking one’s time and listening to one’s own body are the key to safety. Can Acetazolamide mask a severe underlying condition, leading to complications? Acetazolamide does not mask serious underlying symptoms; the medication treats the cause not the symptoms. Acetazolamide accelerates acclimatisation. As acclimatisation occurs, the symptoms will resolve. Acetazolamide does not mask anything; if you are still unwell then your symptoms will persist despite the medication. Will my symptoms get worse if I stop using Acetazolamide? If you feel better when you are taking Acetazolamide, it is because your underlying condition has improved. If you stop taking Acetazolamide, your acclimatisation will slow down to its natural rate, enabling you to gauge how well your recovery is progressing. What are the benefits of Acetazolamide tablets? Even in its mildest form, altitude sickness can have a very negative impact on what should otherwise be an enjoyable experience. In severe cases, it can put your health at serious risk, sometimes even requiring hospitalisation. Acetazolamide tablets can help to prevent issues caused by altitude sickness or mountain sickness, provided they are used in conjunction with appropriate precautionary measures such as acclimatisation. Are Acetazolamide tablets suitable medication for me? Acetazolamide is classed as a ‘sulphonamide derivative’ so if you are sensitive tosulphonamides, you should not take this medication. There are other conditions and some prescription drugs which are not compatible with Acetazolamide, so be sure to consult a doctor and understand the warnings before taking it. Can I take Acetazolamide tablets and still drink alcohol? Yes you can drink alcohol whilst taking Acetazolamide tablets but it is not advisable if you are experiencing the symptoms of altitude sickness. Alcohol can make the symptoms of altitude sickness worse. Can I drive whilst I am taking Acetazolamide tablets? Yes you can drive and take Acetazolamide tablets, however if you notice any adverse reactions or side effects, you cease taking the medication and discuss the symptoms with your doctor. Can I buy Acetazolamide tablets over the counter? Acetazolamide is a prescription-only drug, so you cannot buy it over the counter before going on holiday. You must allow enough time to make an appointment with your GP ahead of time, or use our online service which can issue you with a doctor-verified prescription based on your responses to our health questionnaire. How do I store Acetazolamide tablets? Acetazolamide tablets come in a handy 250mg size making them very easy to store and take whilst on the move. It is recommended that you store the tablets in a safe and secure environment at a temperature below thirty degrees centigrade, preferably at room temperature. Always keep Diamox tablets out of the reach of children. Is Acetazolamide the same as Diamox? Acetazolamide used to be sold as Diamox, but the Diamox brand was discontinued. Since acetazolamide was the active ingredient in Diamox tablets, it was rebranded as Acetazolamide. 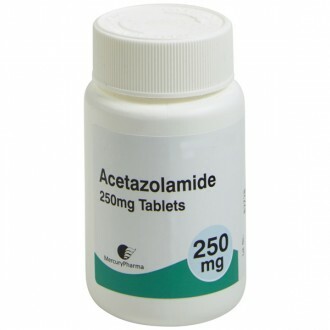 Acetazolamide is manufactured by Mercury Pharmaceuticals Ltd., Capital House, 85 King William Street, London EC4N 7BL, UK.